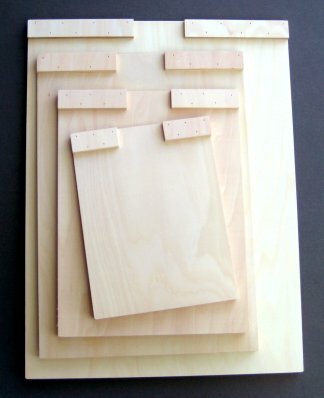 The professional tools in this set are all the basic smaller tools you need for carving detailed woodblocks. 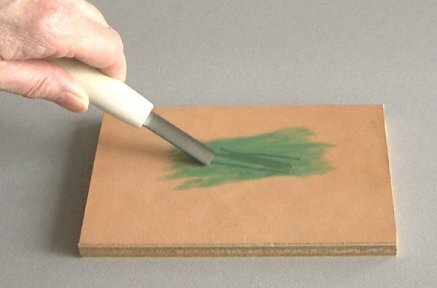 For more information about Futatsu Wari Moku Hanga To (two-part handle woodblock carving tools), please click here. The Futatsu Wari Hangi To (knife) is the traditional tool used to outline areas of the block you want to keep, while the three Komasuki (u-gouges) are used to clear wood away or create interesting textural patterns. The Aisuki is designed to remove the peaks left behind by the Komasuki. Its rounded tip glides easily through the wood. Sankaku To (v-gouge) makes very fine lines; some people like to use it in place of the Hangi To. The six tools come in a free 2 3/4" x 6 1/2" (68 x 162mm) metal box for protection, the perfect size for traveling. If purchased individually, the price would be $270.50. Sorry, no substitutions.